Miami Heat star LeBron James will be named the NBA Most Valuable Player for the 2011-2012 NBA season, ESPN reported on Friday, giving the American superstar the award for the third time. James won the 2009 and 2010 NBA Most Valuable Player awards but was beaten in voting for the award last season by Chicago Bulls star Derrick Rose. ESPN cited an unnamed source close to James in reporting that James would be announced as the winner this weekend. Miami will play host to Indiana in game one of their best-of-seven Eastern Conference playoff series on Sunday. 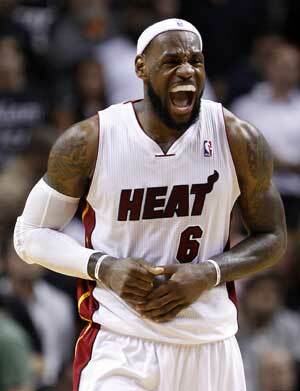 The Heat announced plans late on Friday night for an event in the team's home arena on Saturday afternoon. If James takes his third MVP award, he will share fifth on the all-time list of multiple MVP winners. Kareem Abdul-Jabbar won the award six times with Bill Russell and Michael Jordan winning it five times each Wilt Chamberlain taking it four times. James, who has yet to win an NBA crown in his ninth NBA season, averaged 27.1 points, 7.9 rebounds, 6.2 assists and 1.9 steals a game this season for Miami while hitting 53 percent of his shots from the field. NBA scoring champion Kevin Durant of Oklahoma City and Kobe Bryant of the Los Angeles Lakers figured to be major contenders for the award as well.